Confucius (ca. 551-479 B.C.) - Is Confucianism a philosophy or a religion? The best answer is likely that it's a philosophy of such high regard that many consider it a religion. 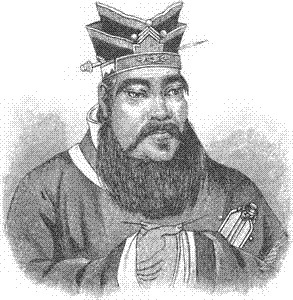 The eponymous Confucius (or Kung-Fu-Tse) is considered the greatest sage of the Eastern world. Like his contemporary, Sun-Tzu, little is known about his life. But both are remembered for their teachings; Sun-Tzu for his teachings on war, and Confucius for his teachings on life. His famous sayings, called aphorisms, were collected into a single work called the Analects, which was completed many years after his death. While they are considered a road map for living, they reveal little about his personal life. Sima Qian's Shiji contains the most detailed account of Confucius, but modern historians question its accuracy. In addition, the famous Confucian, Mencius, wrote a work called the Mengzi which provides some information, and there is also an account of him in the Zuo Zhuan (chronicles of Zuo). The year of his birth seems pretty well pinned down, the 22nd year of Duke Xiang of Lu, or 551 B.C.. There is disagreement over his family background, ranging from nobility to commoner. One possible explanation for this discrepancy is that his ancestral family was reputed to have been aristocratic, but forced to flee from the state of Sung to Lu when a revolution overthrew the ducal house. One of Confucius' goals appears to have been to effect change on a national scale. Around the age of 50 he became a government official in the state of Lu. He tried to convince other officials to govern through moral authority and not intimidation. Through his teachings, he developed a significant following. But his message was not always well received, and he made almost as many enemies as followers. Sometimes forced into exile, sometimes with threats made to his life, he continued to spread his message undeterred. Although, by the end of his life, he believed that he had largely failed in his mission to enlighten the rulers of China. However, his impact on history can hardly be understated as he is remembered as one of the most important Chinese figures ever. Most have heard at least a few of Confucius' aphorisms at one point or another. Here is just one as an example: Confucius says, "Study the past if you would define the future" (In keeping with the spirit of this timeline).